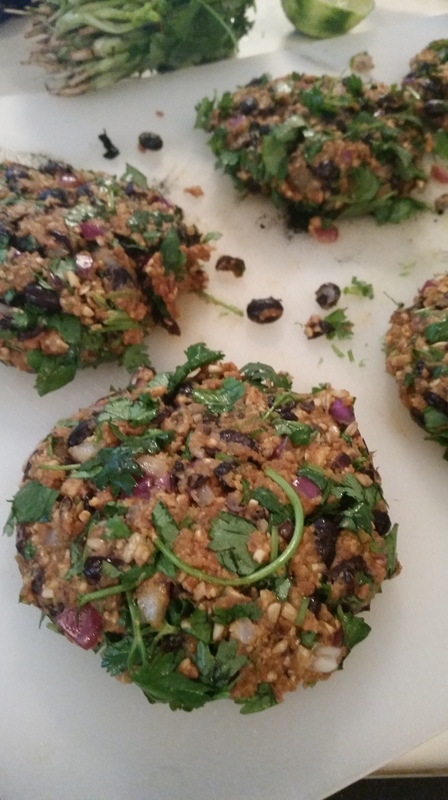 My only new Summer creation, pretty simple and I’m sure there are many various out there but I have found the key to black bean burgers is to roast your beans! Otherwise you often get a mushy burger. I love cilantro, lime and smokey flavours, especially off a bbq. I used an Asian chilli paste that is thick and mild. I think you could pick some up almost anywhere. These burgers freeze well but do not fully thaw them before cooking or I find they will crumble. Spread the black beans out of a baking sheet and bake at 350 degrees for 10-20 minutes. We are looking to dry them out a bit so not to have a mushy burger. If you prepared your own beans they are likely already less moist then a canned type so this baking time depends on what you start with but use your judgement. Pulse Oats in a food processor. Add ¾ of the toasted beans and pulse some more. Add a generous splash of olive oil and red onion then pulse. Add Egg, Chilli Paste and remaining ingredients and pulse some more. Remove from the processor and add the remaining ¼ of the toasted beans. Form into patties and place on a baking sheet in the refrigerate for at least an hour. Fall is here which in my kitchen means soup time. We love cauliflower but growing up I remember cauliflower soup being kinda boring and loaded with cream so I put this flavorful one together. Roasting vegetables ALWAYS makes them taste so much better and the smokey and sweet paprika lends a nice spicy warmth. Finding smokey paprika shouldn’t be too difficult and its fun to have around, I use it in breakfast skillets, on potatoes or in anything I want to have a real smokey flavour. A lot of people enjoy bread with their soups, with this soup I suggest picking up your favourte baguette, gluten-free if you wish and toasting it with garlic. I will also post an easy method for garlic toasted baguette croutons. In your large bowl, toss cut up cauliflower with whole peeled garlic and shallots with 3 tablespoons of olive oil. Season with sea salt and pepper then arrange on a one or two rimmed baking sheet in a single layer. Roast in oven for about 30 minutes or until the cauliflower begins to golden. Heat the remaining tablespoon of olive oil in your soup pot over medium-high heat, add both paprikas and sauté gently for a minute or so. DO NOT BURN. Add the roasted cauliflower, garlic and shallots as well as thyme, cayenne and then 8 cups of stock. Bring to a boil then reduce to simmer for 30 minutes or until the cauliflower is very tender. Remove from heat and let stand to cool enough to purée the soup in a blender. Return to pot, gently reheat and adjust seasonings to taste. Cut baguette on a diagonal into thick 1 1/2 inch slices. Brush with olive oil and dust with fine grain sea salt and freshly ground pepper. Place the baguette slices in a single layer on a baking rack placed on top of a cookie sheet and toast in the oven for 5 to 7 minutes or until lightly browned. Remove from the oven and cool enough to handle. Cut a couple peeled cloves of garlic and rub fresh cut sides on the toasts. Float one or two slices on top of your soup! Chili in Summer?! I know, sounds wrong but Vancouver’s Summer hasn’t exactly been a hot one, a couple weeks past we had a string of days that were less than 14 degrees and one particularly rainy day my man requested chili and corn bread. So, I pulled out my two best chili recipes but he said he wanted all the beans plus meat AND Chipotle AND Cilantro so, I combined them, tweaking and adjusting a bit along the way and, it actually turned out great! It’s warming up out there now so maybe you’ll try these in the fall but in any event, here they are! Sauté onions, garlic and cumin in the oil for a few minutes. Add green peppers and cook for another few minutes. Add tomatoes, all the rinsed beans, spices, wine, honey and chocolate. Bring to a boil then reduce to simmer. Add a little water if needed (depends of the juiciness of your tomatoes), add a teaspoon or so of sea salt and maybe a 1/4 teaspoon of cayenne and simmer covered for at least an hour. Adjust salt and spice and serve! Heat Olive Oil in large heavy bottom pot, sauté garlic and onions with cumin until the onions just begin to brown. Add ground bison and continue to sauté until almost cooked through. Add beans, tomatoes, chile powder, smoked paprika, chipotle chilies, broth and salsa then simmer for 35 minutes. Season with salt and pepper, stir in cilantro and serve with a lime wedge. * Herdez Chipotle Salsa I keep in our fridge for a few different recipes, I like the flavour it adds to this chili but you could omit it if you like. Pre-steam your green beans for just a minute or two. Place into glass baking dish and drizzle with oil or butter. Sprinkle with thyme, sea salt and pepper. Bake at 350 for 10- 15 minutes. Remove and sprinkle with toasted slivered almonds. Here is an easy healthy cauliflower bake that I made tonight. I find a lot of people just cover cauliflower with cheese which totally isn’t my style; I try to use fresh herbs whenever possible but you can also sub in dried. The herbs and sautéed veggies add awesome flavour without hiding the cauliflower and the bread crumbs yield a nice little crunch. I served this with Green Beans with Thyme and Slivered Toasted Almonds alongside Goat Cheese and Arugula stuffed Chicken Breasts, and a Sweet Potato Biscuits. I’ll post those recipes too, I just put them all in the oven at the same time with a 5 minute delay on the beans! Melt butter in a heavy nonstick saucepan over medium heat. Add chopped onions, celery and mushrooms and sauté 4-5 minutes or until tender. Stir in herbs and stock and simmer for 2 more minutes. Add salt and pepper to taste. Stir in cauliflower and toss to coat. Transfer mixture to a lightly oiled baking dish. Sprinkle with breadcrumbs and bake 15 minutes. Note: If you wish to use dried/ground herbs just reduce to 1/4 teaspoon measurements. Super easy, very tasty roasted roots vegetables, change them up however you wish, any root will do! Toss cubed vegetables in olive oil and rosemary. Spread on 2 non-stick or sprayed baking sheets. Sea salt and pepper. Bake Turning a couple times until soft and browned. Approximately 45 min to hour. Roast foil wrapped beets on the rack. Do this because otherwise the beets will turn the rest of the veggies red. Once the beets are done you can simply rub the skin off, chop into cubes and then add to the mix before serving. Can you remember the last time you had Sloppy Joes? I can’t,, pretty sure I was a child but I do remember how tasty it was. Not the healthiest dish to serve your children, sugar laden, full of sodium and high in saturated fats. Today I was given a recipe to try that used tofu, (I’m not a huge advocate of tofu but it did work well) I simplified it, changed up a bunch of ingredients and, it turned out great! Sweet, smoky and spicy, delicious with a toasted kaiser bun or for an even healthier kick try it with brown rice and corn bread. If tofu isn’t your thing either use ground bison or turkey, omit the baking sheet and simply sauté the meat with the onions. * I used Que Pasa Chipotle Salsa, it has all the ingredients needed including liquid smoke. Drain and crumble tofu, toss with 1 tablespoon of oil, 1 teaspoon of sea salt and spread on baking sheet lined with parchment paper. Bake for 15 minutes. Remove and set aside. In your large pot, heat 2 tablespoons of olive oil and sauté onions with 1 teaspoon of sea salt until translucent. Add garlic, jalapenos, red peppers, cumin, chile powder, and all spice, sauté for 5 minutes. Add remaining ingredients, pinto beans with liquid reserve, molasses, chipotle salsa , apple cider vinegar, tomato paste, roma tomatoes, and oregano and simmer for 30 minutes.